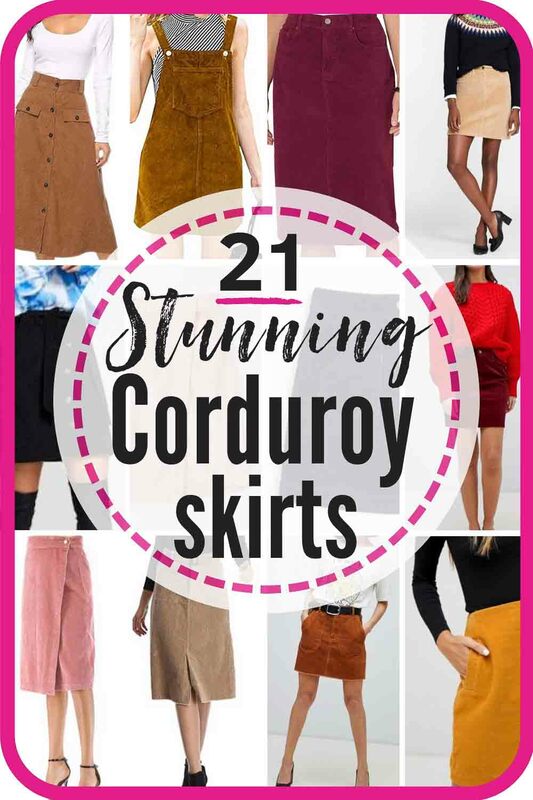 There are fringe benefits to having fashion-loving but thrifty friends. And I’m that kinda gal. I wasn’t always this way. 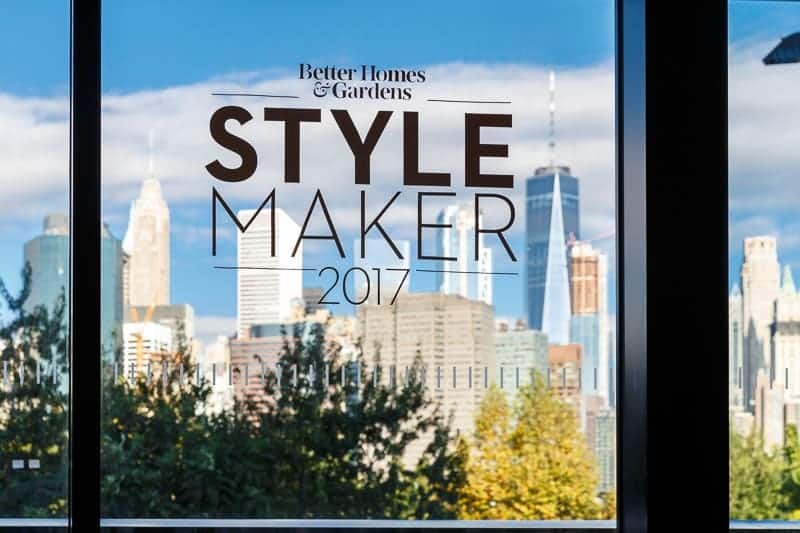 Fashion-loving? Always. Thrifty? Not so much. I’ve only embraced thriftiness because I had to. I was dragged into my first thrifty-club meeting kicking and screaming and pleading to go back to the flushing-money-down-the-toilet meeting. Thriftiness? Bleh. I liked spend-thriftiness. The opposite of budget-savvy, that was my bag. It was more like being budget-blindfolded. Then I had kids. And a mortgage. Once I realized that I had arrived on adult-reality-island and there were no ferries back to fantasy-island, I began slowly but surely embracing thriftiness. Nowadays, I’d say I’m in a healthy zone with money. I don’t mind spending it on things that I really feel are necessary, or worth a good splurge. But I will always err on the side of saving over spending, if at all possible. All this brings me to my friend, Lilly. I’m betting you know Lilly, too. 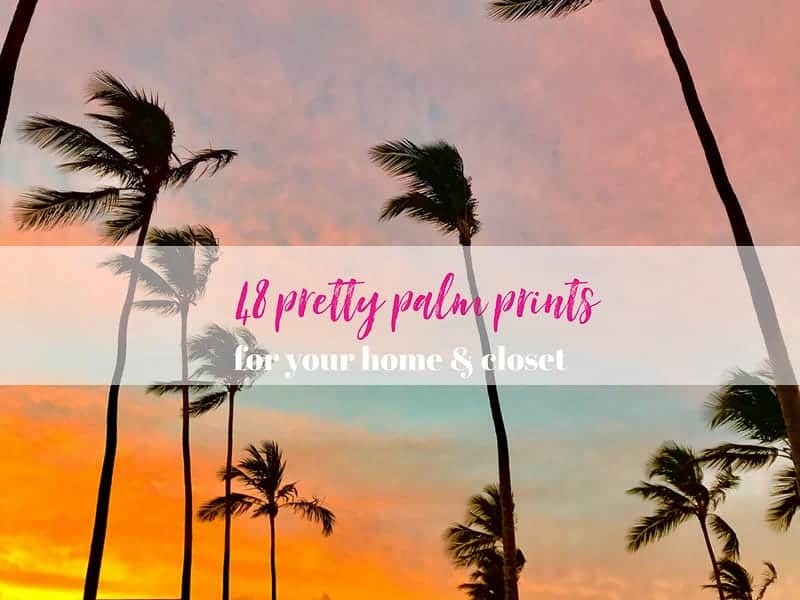 Lilly Pulitzer? Yep. Thought you knew her. Lilly and I have a complex relationship. My friend Lilly is beautiful. And rich. And permanently on vacation. 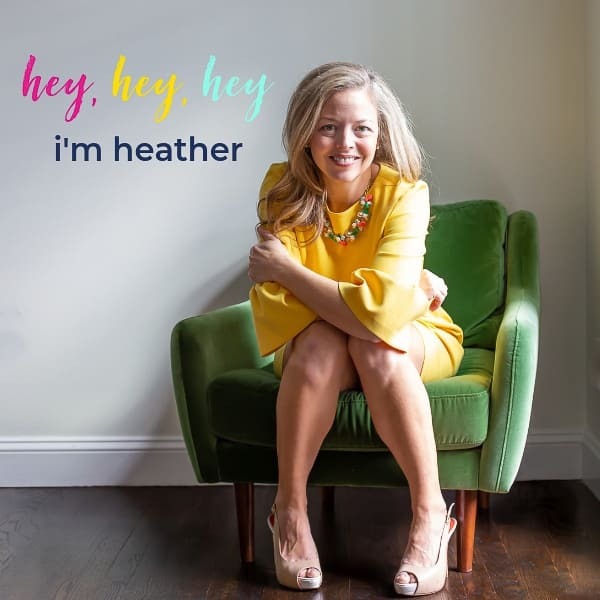 She emails me every week telling me how great her life is and showing off her newest dress, or fun printed shorts, or resort wear outfit-du-jour. And I love Lilly and all of her fun, floral-y, frilly stuff. It speaks to me. It says “come enjoy this strawberry daiquiri by the pool while a warm breeze blows through carrying the sound of reggae past your ears as you nap in a comfy chaise…” She’s wordy that Lilly. 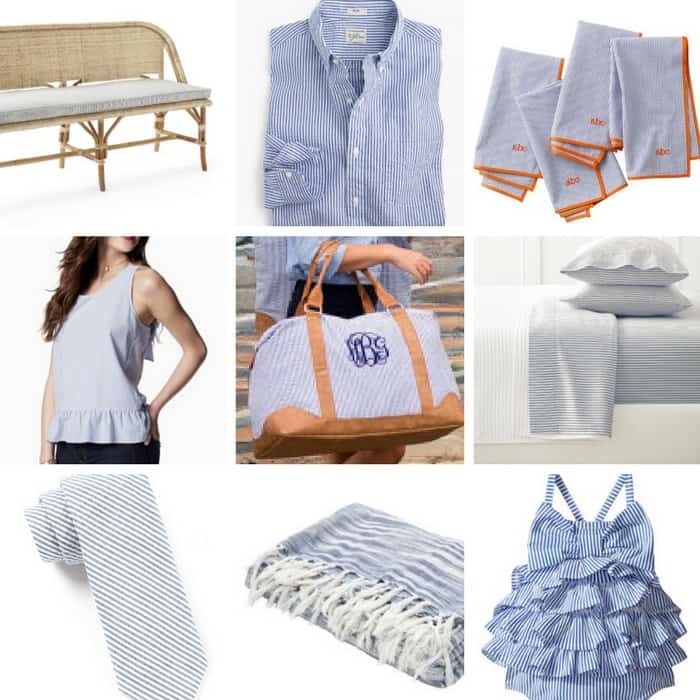 There are PLENTY of times I’ve plunked down money after seeing something new of Lilly’s. Her pants and shorts tend to be my favorites. SUPER comfy, and they let me have the feeling of wearing my fave sweats 24-7, but in a more socially appropriate way. I can wear her relaxed, colorfully-printed pants to work and not have quizzical eyeballs on me wondering why I forgot to change out of my PJs this morning. For that reason alone, I don’t mind spending money on her items here and there. We’ve established that I adore Lilly. However, there are certain times where I think maybe she’s a little over the top. For instance, right now she’s hawking these sandals. The “Zoe sandals”. So cute, right? Super duper fun. But they are $168. And Mama isn’t going to spend that on sandals right now. Sorry, Lilly. But since I loved them so much, I figured I’d try to come up with a more thrifty version. And I did. Check out this quick video tutorial below. It will show you how to get rolling on this project! 1.) 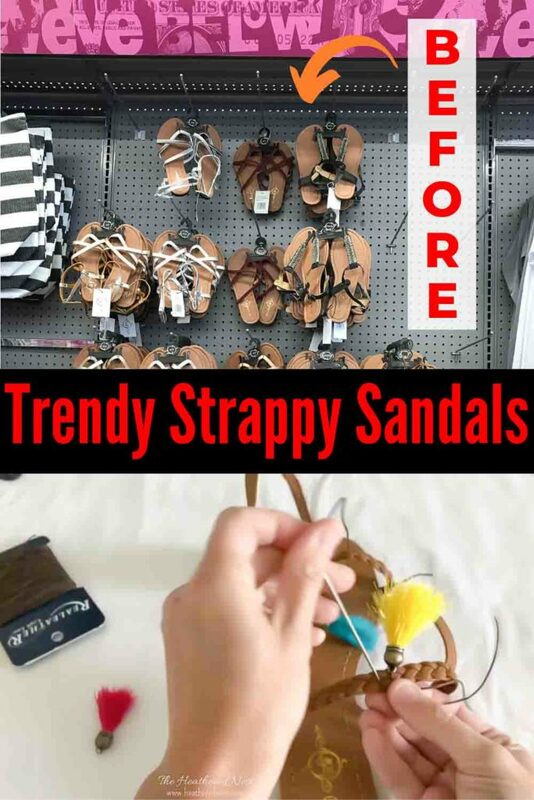 Find some thrifty sandals. I found mine at Five Below. 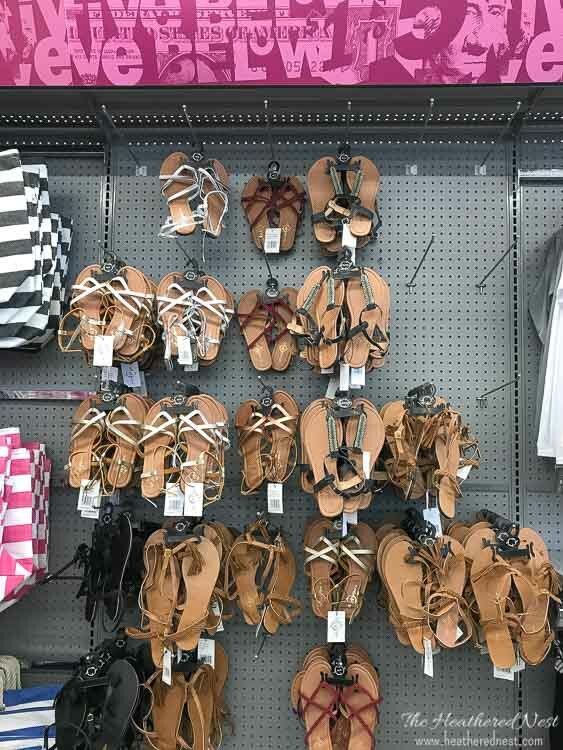 And they had bunches of sandals, for $5 a pair. I grabbed two pair. These are the first. 2.) Try on shoes and mark center point of the strap. Before you attach your tassels, you need to make sure you’re going to attach them in the right spot. What looks like the “center” of your strap when the shoe is off is not necessarily where the true center is when the shoe is actually on your foot! 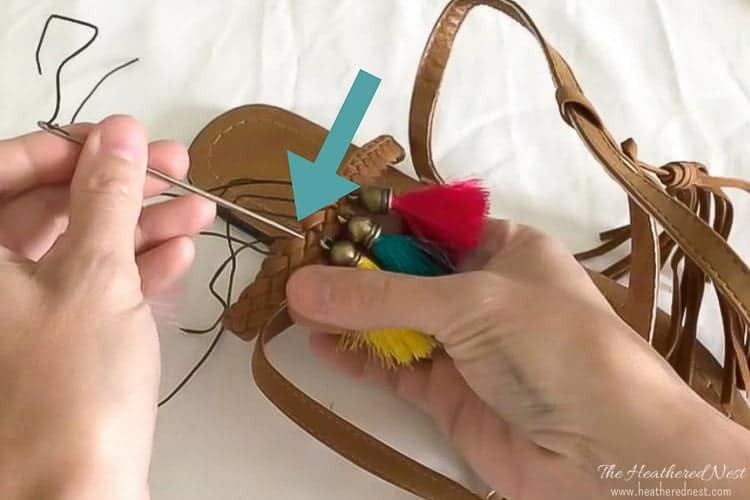 Try on the shoe, and grab a sharpie or safety pin…something you can use to mark the back of the strap in the center point or pin through the center point of the strap you’ll be attaching the tassels to. 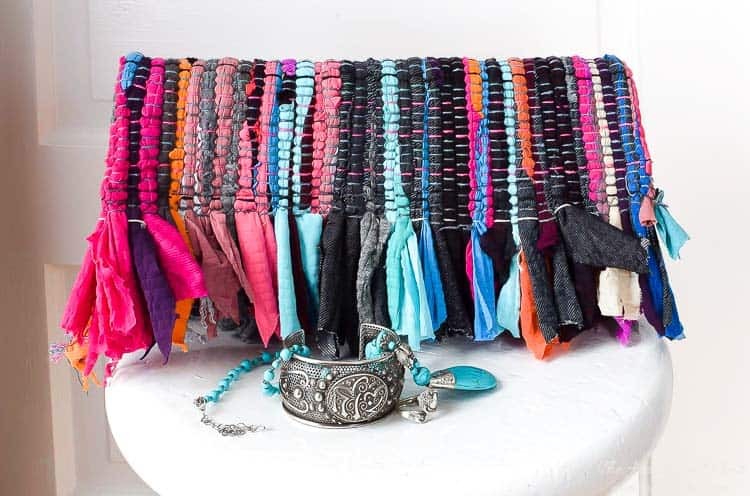 In this case, I’m going to attach four tassels to that braided strap you see above that will fall in the front of my ankle when the shoe is being worn. 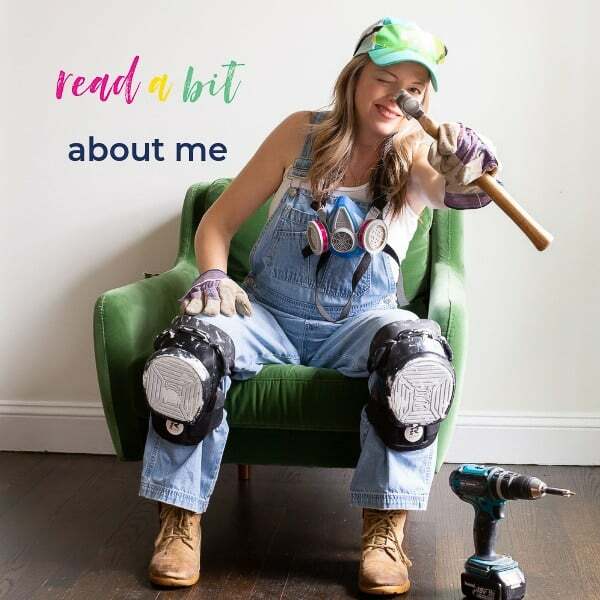 Don’t forget to sign up for VIP access to all the DIY tutorials and guides only available in our resource library. It’s free to join⤴️! 3.) String tassel onto a piece of waxed thread. 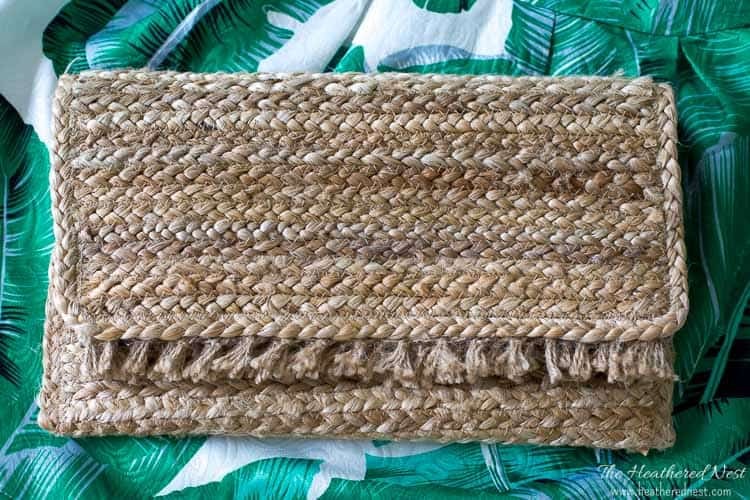 You’ll need about 9-12″ of wax thread per tassel. Thread the tassel. 4.) Use your upholstery needle to insert one end of the wax thread through braided shoe strap. I chose to put four tassels on each shoe. Attaching the center tassels first will help ensure you’re putting the tassels on in the correct location. With the tassel in the center of your 9-12″ piece of waxed thread, place one end of the wax thread through the eye of your upholstery needle. 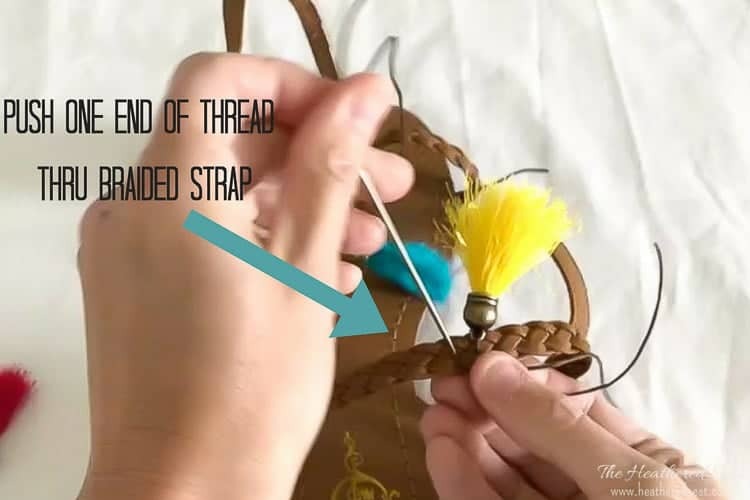 Pass the needle through the braided strap, starting on the outside/top of the shoe and moving toward the inside/bottom of the strap. Once through the strap, remove the needle. Image is of attaching the SECOND tassel. The yellow tassel has already been placed. 5.) Insert the other end of your wax thread into the strap. Re-thread needle, using the end of the wax thread that still remains on the outside of the shoe. 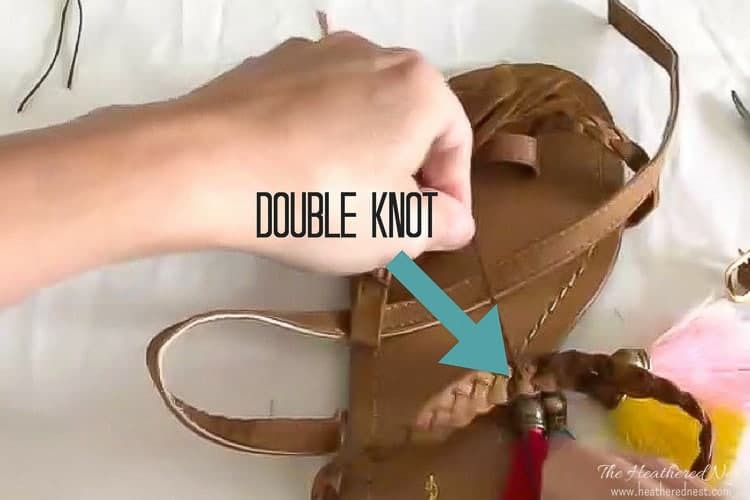 Pass needle/thread through the braided strap from outside of shoe toward inside again. 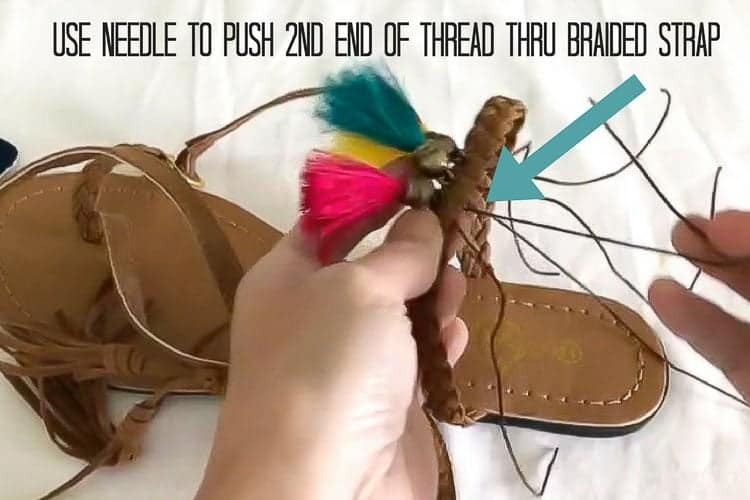 Now both sides of the thread will be on the inside of the shoe, while the tassel remains in front. **Don’t tie off tassel yet. Wait ’til ALL tassels are placed on the shoe. Image shows pulling the second side of thread through for the third tassel (the pink one). 6.) 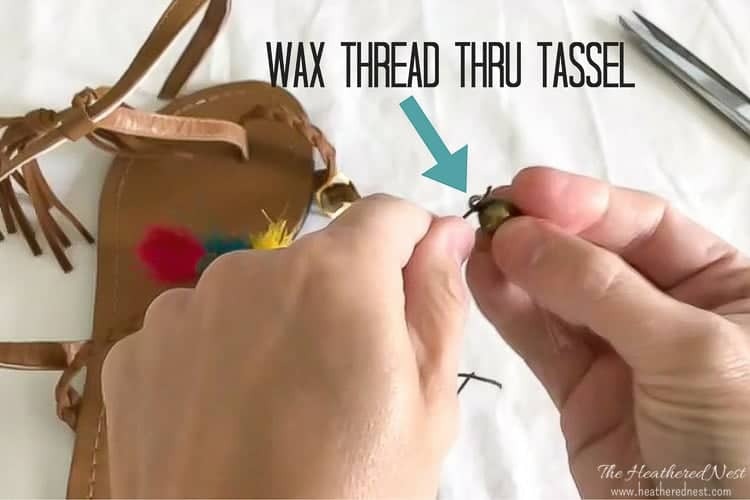 Attach remaining tassels using the same method. 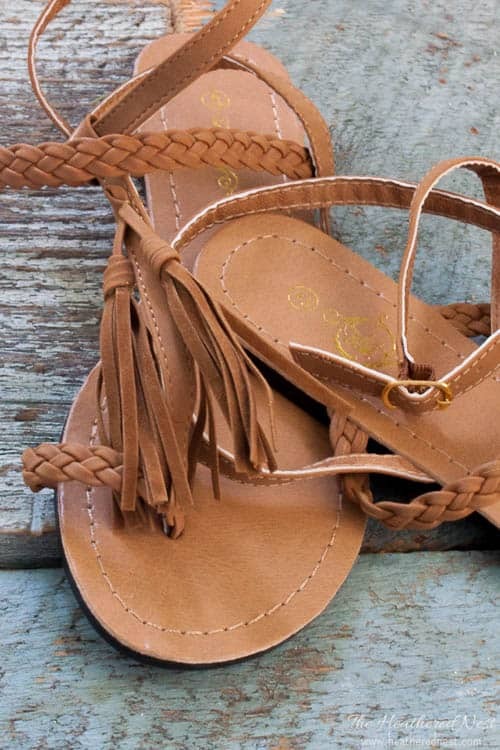 Continue this process for each tassel, moving from the middle tassels toward those on the outside edges of the shoe. 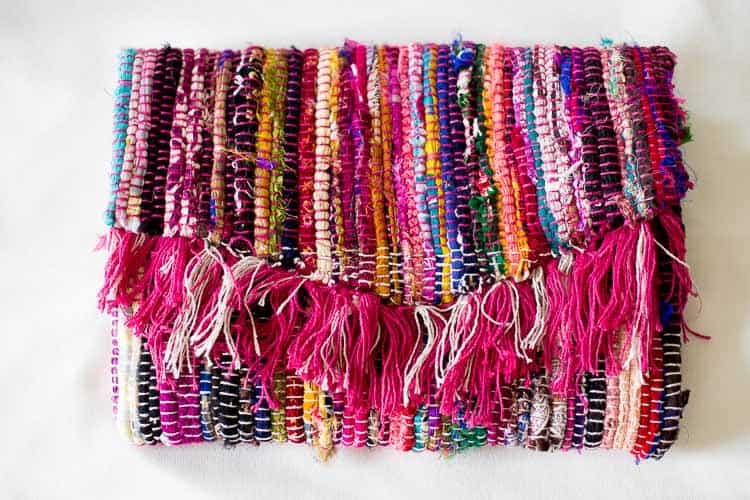 In my case, I threaded the yellow and teal tassels before moving on to the two pink ones. 7.) Try on your shoe. 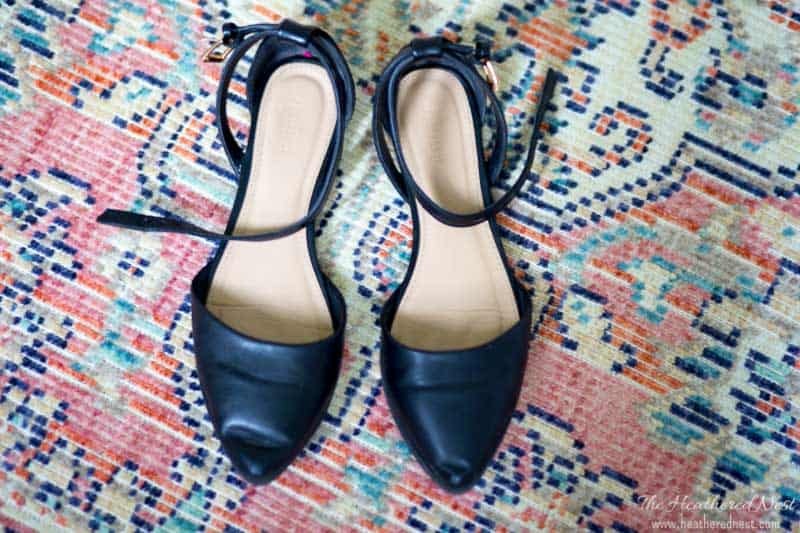 Once all the tassels are attached, try the shoe back on. Are the tassels where you want them? If not, simply pull out the tassel(s) you don’t like and re-attach in the correct spot(s). 8.) Tie off ends of wax thread. Once satisfied with the location of your tassels, it’s time to tie off the ends. I am sure there are some great knots for this, but I only know how to tie one, and that’s a basic square knot. Double knot each tassel in place. Or use a fancy knot if you know one. 9.) Trim excess wax thread. Get out your scissors and trim the rest of that wax thread off. Voila! 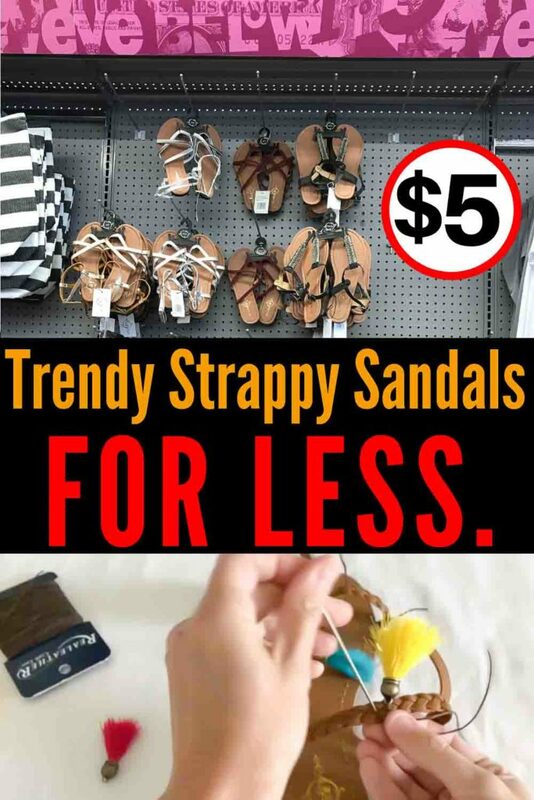 Fancy sandals at a phenomenal price. Not bad for about $6 worth of materials and 15 minutes of my time, eh? 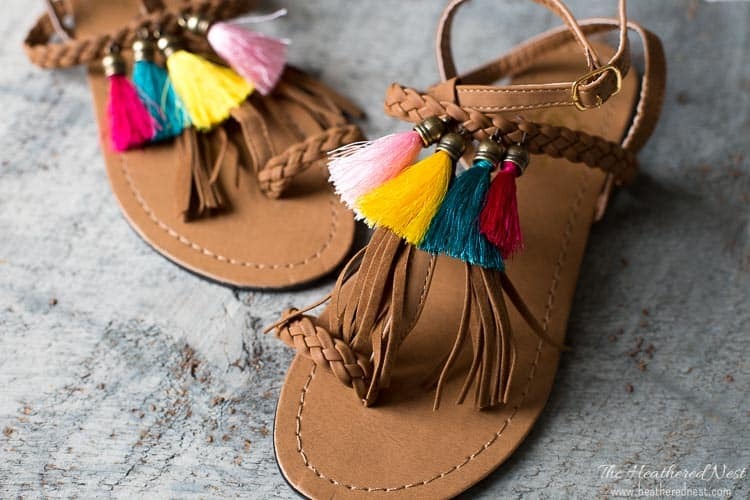 Pin these DIY tassel sandals for later! And if you make a pair, leave a comment (or better yet, a photo) on the pin! That helps others know whether they want to try this project, too! 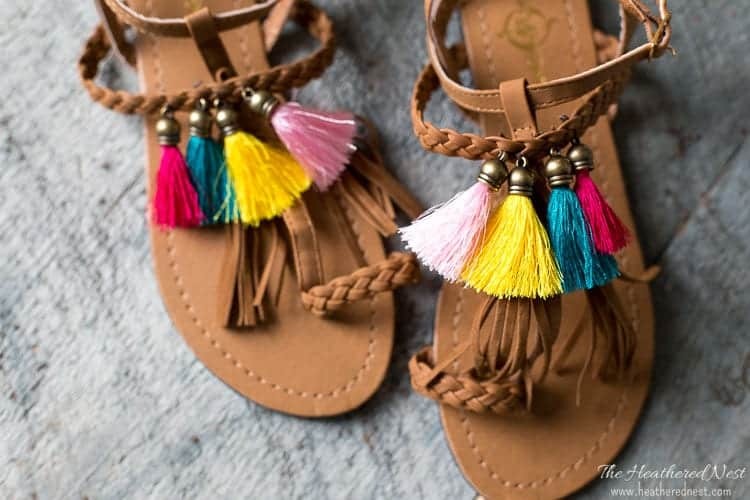 These tassel sandals are so popular now and I’m so in love with them. Love that you were able to do this for so cheap! Thanks for sharing your idea on Merry Monday!